After water, oil is perhaps the most vital fluid for contemporary life. It’s also the most invisible. Huge amounts of effort are expended in hiding the impact of its extraction, refining, and mass consumption. This is perhaps what makes President Obama’s comparison of the Macondo blowout in the Gulf to the Al Qaeda attacks on the U.S. so radical. For the first time, the global oilscape was presented front and center as a huge problem to the American public. The centrality of oil in U.S. politics, its corrupting influence on government agencies such as the Minerals Management Service, the seamy global networks that oil links us to (after all, Osama bin Laden’s family made their money working for the oil potentates of Saudi Arabia), and the massive military expenditures that we must shell out to maintain its flow – all of these factors have been highlighted by the Macondo blowout. Now we find the government telling us that the spill has magically evaporated. I remember a similar story being told after 9/11. I was teaching then, as now, at the College of Staten Island, commuting from Manhattan’s Upper West Side. This meant that I had to wait downtown for an express bus to take me to Staten Island. I would come up out of the subway every day and smell a cutting steely smell on the air. Most people walked around as if things were normal, in that bizarre seeming simulacrum of everyday life that took over from the time of the attacks. But every now and then I would see someone wearing a heavy mask of some sort, and I would think that they really had things sussed out. Had I been waiting around longer for my bus, I probably would have invested in a similar mask. Of course, years later, the government’s assurances that air pollution in downtown Manhattan was negligible after 9/11 have been revealed for the shocking canard that they clearly seemed to me at the time. But such mendaciousness continues, this time in the Gulf of Mexico. We’re told that all the oil has evaporated or been mysterious consumed by microorganisms. 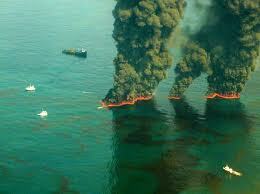 This after BP’s policy of spraying toxic dispersant in a clear attempt to hide the extent and gravity of the spill. Such transparent lying beggars the imagination. I want to close this piece on the Macondo blowout and the global oilscape by recommending an excellent article by the wonderful writer Rebecca Solnit in the London Review of Books. Solnit provides a wealth of important information about the Gulf and New Orleans, putting the Macondo blowout in the context of a long history of environmental destruction in the area. New Orleans and its surrounding bayous and waters, one of the most ecologically and culturally vibrant parts of this country, has been dealt yet another death blow. We all stand to lose a great deal if this unique and vibrant place is destroyed.